Most of the important contributions to our current understanding of muscle contraction and coordination have been made since the turn of the twentieth century. Early observations utilizing the sartorius muscle of the frog helped to demonstrate the characteristics of the individual muscle twitch and also established that contracting muscles produce heat and are sensitive to the effects of temperature. Ultrastructural studies of individual muscle fibers (cells) were just beginning at this point. 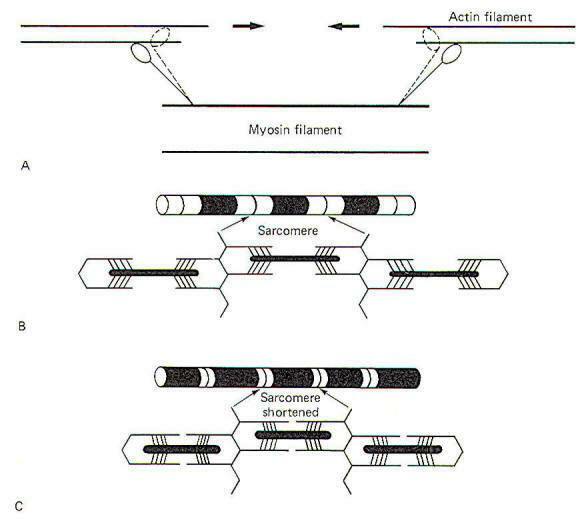 while the "sliding filament" theory describing muscle contraction is just over 50 years old. Researchers have learned that muscle contraction cannot proceed in the absence of adenosine triphosphate (ATP) and Ca2+ ions. Most of our assumptions about the role of these two components during contraction is explained by the use of models. Current models are most often based on the classic work of A. F. Huxley, who in 1957 proposed a theory concerning the interaction of the filaments actin and myosin in the contraction process of skeletal muscle. A single skeletal muscle is composed of many thousands to millions of long, narrow contractile cells called muscle fibers (Fig-1). These fibers are clustered together in parallel bundles called fasciculi. Each muscle fiber is 10 to 80 µm in diameter and is composed of hundreds to thousands of even smaller units called myofibrils. 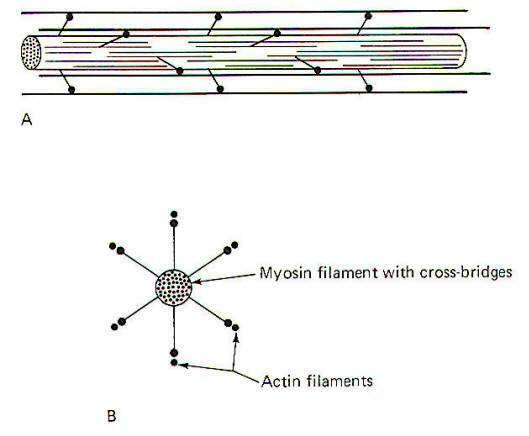 Myofibrils contain the proteins actin and myosin, which are the sliding myofilaments that are activated during muscle contraction. Each individual muscle fiber is innervated by a single branch from a motor neuron. This branch (telodendron) forms a neuromuscular junction (NMJ) with the muscle cell membrane (sarcolemma), Impulses arriving on the nerve fiber are transmitted to the sarcolemma and ultimately cause the contraction of the muscle fiber. A muscle fiber is a multinucleated cell whose sarcoplasm (cytoplasm) contains mitochondria and stores of glycogen. The availability of glycogen, which is easily converted to glucose, ensures that the mitochondria will have sufficient amounts of this readily available nutrient as an energy source for the synthesis of ATP, a high-energy phosphate molecule needed to energize the contractile process. In times of low muscle activity, excess ATP is temporarily converted to creatine phosphate. Most of the millions of individual muscle fibers within a single muscle run the entire length of the muscle. Because they run parallel to each other, the tensions developed by the individually contracting fibers summate to produce the overall tension developed by the muscle. In a sustained contraction, the individual muscle fibers alternate firing with each other so that some are contracting while others are relaxing. This process helps avoid fatigue yet maintains a smooth and prolonged muscle contraction. Individual myofibrils present a striated appearance of alternating light and dark bands (Fig-1). The wide dark bands (A bands) represent the region of relatively thick parallel-running myosin filaments. The white bands (I bands) represent the region of parallel-running actin filaments. The I band is bisected by a thin dark zone, the Z line. A narrow light region (H zone) bisects the A band. This distance between two Z lines is a sarcomere, typically 2 µm long in the resting muscle fiber. 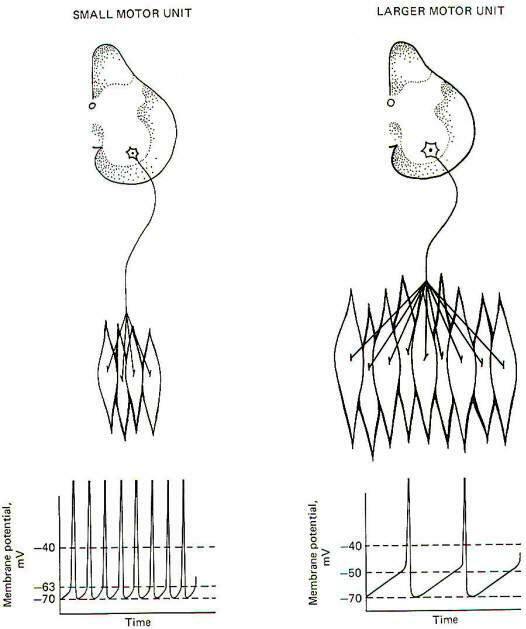 During contraction, opposing actin filaments slide toward each other over the myosin, shortening the sarcomere and causing a narrowing of the I band. Because the bands and lines of each of the thousands of parallel myofibrils within a muscle fiber are adjacent to each other, the banded appearance is also characteristic of the entire muscle fiber. The arrival of impulses at the end plate of the motor neuron causes the release of ACh into the synaptic cleft between the end plate and the folded muscle fiber membrane. This typically produces an end plate potential (EPP) in excess of the excitation threshold, generating impulses which travel over the muscle fiber membrane and ultimately deep into the muscle fiber and activating the contractile process. 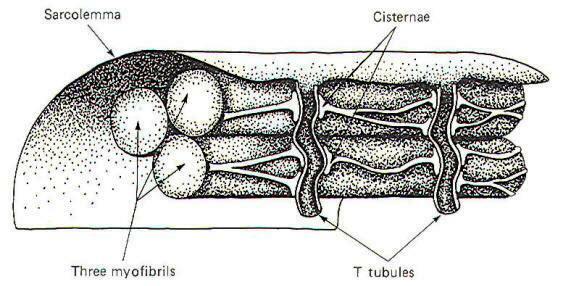 Extracellular fluid-filled channels called T tubules travel through the muscle fiber at right angles to the surface (Fig-2). In humans these channels typically traverse that part of the muscle fiber where actin and myosin overlap. Among the myofibrils between the T tubules, are Ca2+­rich organelles known as the longitudinal sarcoplasmic reticula (LSR). The cisternae (enlarged ends of the LSR near the T tubules) are particularly rich in Ca2+ ions (Fig-2). 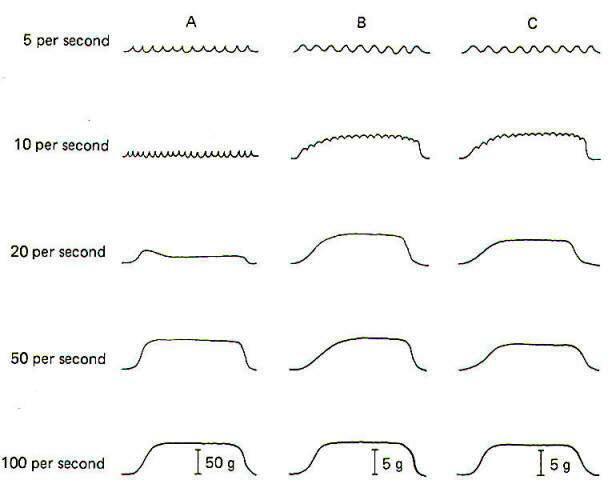 When impulses are generated on the sarcolemma, they travel over its surface and down the T tubule (Fig-3). The arrival of the impulse in the vicinity of the cisternae causes the sudden (within microseconds) release of large quantities of Ca2+ ions into the sarcoplasm where the actin and myosin overlap. These free Ca2+ ions then contribute toward activating armlike extensions of the myosin filaments, known as cross-bridges, which subsequently attach to the actin filaments and slide them inward toward the center of the sarcomere, causing the muscle fiber to shorten. 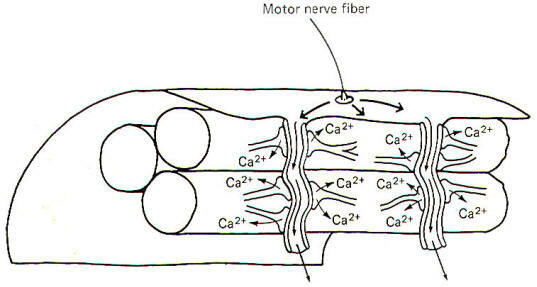 As long as the Ca2+ remains in the sarcoplasm, the muscle fiber will remain contracted. Once impulses stop traveling across the sarcolemma, the Ca2+ is immediately and actively reabsorbed back into the cisternae and the muscle fiber relaxes. Each myosin filament is composed of approximately 200 myosin molecules, each of which has a molecular weight of 450,000. Each molecule has a light meromyosin shaft and a heavy meromyosin armlike extension, the cross-bridge (Fig-4). 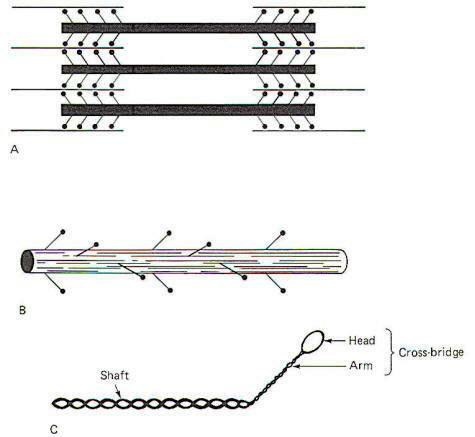 The shaft is formed by two twisted strands of polypeptide which are more or less continuous with two twisted strands in the cross-bridge arm. At the tip of the arm is a head composed of globular protein. The heavy meromyosin of the arm and head form the cross-bridge. The cross-bridge is hinged to allow movement between the head and the arm and again between the arm and the shaft. The shafts of approximately 100 myosin molecules lie together in an orderly fashion at each end of the myosin filament. Approximately 50 cross­bridge pairs radiate out from the central axis of the myosin filament at each end. The myosin filament is about 1.6 µm long with cross-bridges radiating out from most of its length with the exception of a small region (0.2 µm) at its equatorial point. The radiation of cross-bridge pairs is regular and orderly with each cross­bridge emerging 14.3 nm from the previous pair in the filament. In addition, each cross-bridge pair is displaced axially 1200 from the previous pair. Thus every third pair is in the same spatial plane and is separated by a linear distance of 42.9 nm. Because of this spatial arrangement, six helically arranged actin filaments can make multiple contacts with the cross-bridges at each end of the myosin filament (Fig-5). The actin filament is composed of two kinds of actin. These are G actin and F actin. G actin is composed of small protein molecules (molecular weight, 47,000) capped by a molecule of adenosine diphosphate (ADP). This unit complex, about 5.4 nm in length, is polymerized to form a long strand of F actin. An actin filament is formed when two F actin strands are helically twisted together around tropomyosin, which lies in the groove between the two. Troponin, associated with the tropomyosin, configurationally "covers" the ADP sites of the individual G actin molecules when the muscle fiber is relaxed (Fig-6). The ADP sites occurring every 2.7 nm along the actin filament are the active sites to which the heads of the myosin cross-bridges attach. In the resting muscle no attachments are made as the troponin effectively prevents interaction of the two. However, when the muscle fiber is stimulated and Ca2+ ions are released by the cisternae, the troponin (which has a high affinity for Ca2+ ions) binds with them and is configurationally reoriented so as to uncover the active ADP sites, allowing the heads of the myosin cross-bridges to bind. In the resting state, the actin and myosin are not in contact because of the interference of the troponin. Thus the sarcomere is at its relaxed 2-µm length. The heads of the cross-bridges are in a "cocked" state, storing potential energy. When the cocked heads bind with the ADP active sites (following Ca2+ release), some unknown trigger uncocks the heads, causing them to pivot at their hinges with the arms and sliding the actin filaments inward. The entire arm also pivots slightly (Fig-7). Sarcoplasmic ATP causes the heads of the cross-bridges to let go of the actin filaments and provides the energy for recocking them. The head of the cross-bridge itself probably provides the adenosine triphosphatase (ATPase) activity for this process. Subsequently the recocked heads bind with other active sites, uncocking them and sliding the actin filaments still further along, and so on. Consequently the sarcomere is shortened with a noticeable decrease in the width of the I band. Motor unit consists of a motor neuron and the group of skeletal muscle fibers which it innervates. Three types of motor units are found in skeletal muscle. The largest of these are the type A motor units, which are characterized by high contractile speed and power. The term largely refers to the relative number of muscle fibers in the motor unit. Type B motor units are the smallest and are characterized by slow contractile speed and relatively little power, but a high resistance to fatigue. Type C motor units seem to represent a compromise between the other two. They are intermediate in size, contractile speed and power, and susceptibility to fatigue. These and other characteristics of the three types of motor units are listed in Table-1. The specific contraction requirements of a particular muscle determine the type of motor units found in that muscle. Muscles which must produce great tension but are only called on periodically will likely incorporate a high percentage of type A motor units in their organization. Such muscles trade off resistance to fatigue in favor of contractile speed and power. On the other hand, muscles which must support the body against gravity in maintaining the upright posture must be continually active and demonstrate a high resistance to fatigue. Such muscles would be expected to incorporate a high percentage of type B units in their design. Still other muscles need to incorporate the best features of both and include a percentage of type C units along with the others. A single muscle often contains all three types of motor units. Nevertheless, limb muscles often show a preponderance of type A or type B units and are thus often classified as "fast" (phasic) or "slow" (tonic) muscles, respectively. The gastrocnemius is an example of the former, while the soleus is an example of the latter. In order to appreciate the characteristics of each type of motor unit, let's compare the contractile characteristics of these two muscles. The soleus and gastrocnemius muscles are well suited for comparison. While each has a different origin, they insert together into the common tendon of the calcaneus and serve to extend the foot. Nevertheless, their histology and contractile characteristics are quite different, reflecting the tonic role of the soleus in providing continual support of the body against gravity and the more transient role of the gastrocnemius in powering the phasic activities of walking, running, and jumping. The soleus is a good example of a slow-twitch tonic muscle. Its fibers must be continually active while a person is standing in order to give support against gravity. It plays a similar role in the cat. Consequently it must be resistant to fatigue. Appropriately we find that its fibers contain a large amount of mitochondria, enabling it to easily produce the large amounts of ATP needed to power its continual contractions. Similarly its fibers are amply supplied with capillaries able to saturate the oxygen-carrying pigment myoglobin. which is abundantly found in its type B muscle fibers. This is a necessary feature for the aerobic production of ATP by its mitochondria. The red color of the soleus and other such muscles is due to the color of the myoglobin as well as the blood in the muscle's abundant capillary supply. Pale muscles such as the gastrocnemius are often noted for periodic strong contractions rather than continual use. They are characterized by larger sarcoplasmic reticula than are found in red muscles such as the soleus. This enables them to release large amounts of Ca+2 quickly, producing rapid and strong contractions. Because such muscles lack large amounts of myoglobin, mitochondria, and extensive capillary supplies, their ability to aerobically produce ATP after a period of strong activity is considerably less than that of most red muscles. Hence they are also more susceptible to fatigue. The correlation between color and speed of contraction is not always perfect. however, it should be cautious about thinking of red muscle as being synonymous with slow twitch and pale muscles with fast twitch. 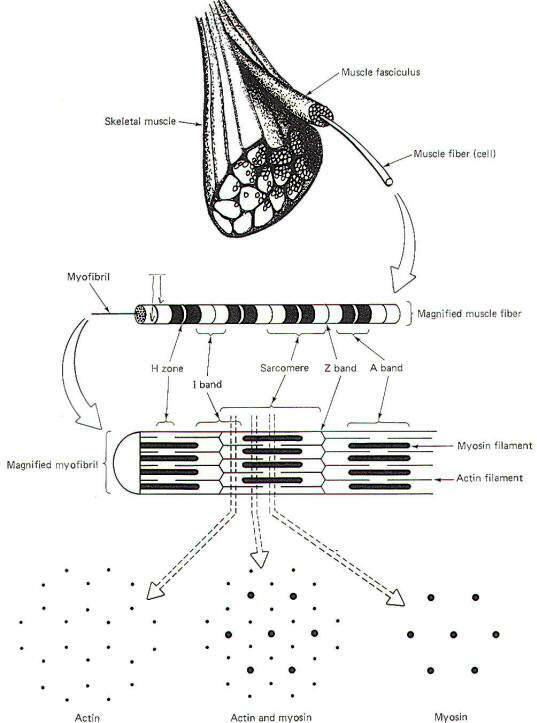 Like motor units, muscle fibers are also classified by type. When muscles are specifically treated to assay them quantitatively for mitochondrial ATPase, three types of fibers can be identified. The largest of these contain relatively few mitochondria, are poorly supplied with capillaries, show little mitochondrial ATPase, contain relatively little myoglobin, and are pale in color. These are type A muscle fibers. They correspond to type A motor units. Type C muscle fibers represent the opposite extreme. They are the smallest fibers, contain the highest amount of myoglobin, are dark in color, are amply supplied with capillaries, contain many mitochondria, and show the highest ATPase activity. They correspond to type C motor units. Type B muscle fibers are intermediate in size, mitochondrial concentration, ATPase activity, capillary supply, and myoglobin concentration. They correspond to type B motor units. The soleus is composed almost exclusively of type B fibers. The gastrocnemius, on the other hand, contains all three types; however, type A fibers constitute about 50 percent of the fiber population, and because of their relatively large size actually make up about 70 percent of the bulk of the muscle. The rest is composed of type B and type C fibers. Certain characteristics of motor units are determined by the properties inherent in the motor neuron itself. The motor units in the soleus muscle are innervated by small, slowly conducting alpha motor neurons. On the other hand, the neurons which innervate the large type A- muscle fibers of the gastrocnemius muscle are larger and have greater conduction velocities. The size of the neuron cell body is directly related to the diameter of the conducting fiber. Small-diameter nerve fibers have small cell bodies. Experimentation has shown that the smaller the cell body, the lower the excitation threshold for the production of an action potential. Therefore, the excitability of a neuron is an inverse function of its size, and less input stimulation is subsequently required to fire it. Therefore the participation of a motor unit in a graded muscle activity is dictated by the size of its motor neuron. Now recall that if the firing rate of a neuron depends on the degree to which its central excitatory state (CES) exceeds the excitation threshold (ET), it is not surprising to find that a CES of 30 mV would produce a higher firing rate in a small motor neuron with a low excitation threshold than it would in a larger neuron with a higher threshold (Fig-8). The number of muscle fibers in a motor unit is also directly related to the size of its motor neuron. Small motor nerve fibers form small motor units and large motor nerve fibers form large motor units. Since small motor neurons fire more frequently than larger neurons because of their relatively greater susceptibility to discharge, it follows that the muscle fibers in these small motor units are more heavily "used" than those associated with larger units. Because of this high firing rate, small motor units must be relatively resistant to fatigue. Therefore it is not surprising to find their overwhelming incorporation into muscles which are often continually active and require high fatigue resistance such as the soleus. Conversely the gastrocnemius, a phasic muscle, is subject to intermittent bursts of high activity. Its motor units have higher excitation thresholds because of the relatively larger motor neurons innervating its type A muscle fibers. These units will become active only when the input stimulation to the motor neuron pool in the spinal cord reaches a sufficiently high level. Nevertheless, the resting muscle tone found in the gastrocnemius and other such muscles is probably due to the activity in its type B and C motor units, which are more susceptible to firing and thus maintain a steady discharge frequency. Any long-term resistance to fatigue which these muscles possess is also probably due to the activity in its type Band C motor units. There is much evidence that world class long-distance runners have a higher than normal percentage of type Band C motor units in their phasic muscles, enabling them to cover many miles of continuous running without significant muscle fatigue. Large motor units produce more tension than smaller motor units. This is possible because the large units incorporate more muscle fibers than small units. We also know that motor units obey the all-or-none principle, which means that if the motor unit fires at all, all of its muscle fibers contract together. Now because all the fibers in a muscle run parallel to each other, the tension produced by each is added to all the others, producing the combined tension of the motor unit. Examination of Fig-9 will show that the contractile tension developed by the motor units within a single muscle are not identical. Instead they represent a wide range which gives the muscle a choice of variable tension which it would not otherwise possess. The maximal tetanic tension of a representative sample of 97 motor units of the soleus muscle are plotted in 5-g groups against the number of units in each group. To obtain the records, a stimulating current was delivered to 97 individual motor nerve fibers in the ventral root of the VIIth lumbar and 1st sacral nerves of the cat. Muscle tension was measured by connecting the soleus muscle in series with a transducer. Notice that the maximum tension developed by the largest motor units of the soleus was 40 g. The average tension was 14.8 g per unit. Compare this with the higher tension developed by 103 representative motor units from the gastrocnemius muscle when it was similarly examined (Fig-10). 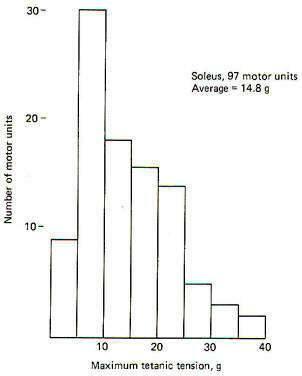 In this case the motor units are plotted in 10-g groups against the number of units in each group. As might be expected from the relatively large motor units found in the gastrocnemius muscle, the average tension per unit is higher (35 g per unit) with its largest units producing up to 120 g.
Certain characteristics of the motor unit are functions of qualities inherent in the muscle fibers themselves. Nevertheless, the different qualities possessed by muscle fibers are also determined to some extent by the type of nerve fibers which innervate them. During fetal development, at the time of their first innervation, all the limb muscle fibers in mammals are similar in contractile behavior. However, following innervation, each motor unit develops a speed of contraction which is determined by its motor neuron. Fast-twitch muscle fibers are innervated by the large motor neurons, while slow-twitch muscle fibers are innervated by smaller motor neurons. There seems to be little doubt that the neuron exerts a trophic influence on the development of the muscle fiber. In a telling experiment with 1-day-old kittens, J. C. Eccles showed that the type of motor innervation determines to some extent the speed of muscle contraction which develops. He separated the nerve to one fast-twitch and one slow-twitch muscle of the hind leg. He then reconnected the nerve portion which formerly innervated the slow-twitch muscle to the fast-twitch muscle. He similarly reconnected the nerve portion formerly innervating the fast-twitch muscle to the slow-twitch muscle. After reinnervation had been successfully completed and the kitten had recovered, he noted that the former fast-twitch muscle now contracted more slowly while the former slow-twitch muscle now contracted more quickly. Evidence now indicates that changes in twitch velocity following such reinnervation experiments probably results from alteration in the ATPase activity of the myosin and the rate of Ca2+ ion release by the cisternae of the LSR. Examination of Fig-11 will show that the soleus is a slow-twitch muscle. When the time to the peak of contraction of 81 randomly selected motor units is plotted against the number of units in each 10-ms group, we see that there is a wide range of contraction times within the muscle. The shortest time is 58 ms and the longest is 193 ms, with the greatest number falling between 80 and 90 ms. The slow-twitch nature of the soleus muscle can be seen when it is compared to the gastrocnemius. 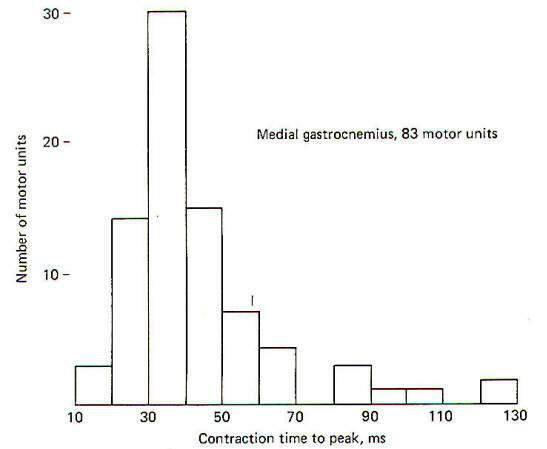 When the contraction times of 83 randomly selected gastrocnemius motor units were plotted against the number of units in each 10-ms group. it was observed that they fall into two groups: a large one from 18 to 70 ms and a smaller one from 84 to 129 ms (Fig. 5-12). There is a relationship between the contraction velocity and the tension developed by a motor unit. As a group, large motor units (those producing the most tension and innervating the greatest number of muscle fibers) contract quickly, while smaller motor units produce less tension and contract more slowly. If a contracting muscle is stimulated again before it has had a chance to fully relax, a second contraction will fuse with the first, producing tetanus. The minimum stimulating frequency necessary to do this depends on the duration of the previous twitch (single contraction in response to a single stimulus). Motor units with brief contraction times (larger units) require a higher stimulating frequency to produce tetanus than do smaller slow-twitch units. In Fig-13 a large and small motor unit from the gastrocnemius of the cat were stimulated repeatedly at 5, 10, 20,50, and 100 stimuli per second. Notice that the large unit in column A showed little tetanus until the frequency reached 20 per second and didn't develop maximum tension until the frequency reached 100 per second. By comparison, the small motor unit in column B began to tetanize at the relatively low frequency of 10 per second and was nearly maximal at 20 per second. Column C shows the response of a soleus motor unit similar in size to the small gastrocnemius motor unit in column B. Remember that most of the motor units in the gastrocnemius muscle have shorter contraction times than most of the soleus units. It is not surprising to find that the average frequency required for tetanization of the gastrocnemius motor units is greater than we find in the soleus motor units. Nevertheless, the gastrocnemius does contain some small motor units with contraction speeds and tetanization frequencies similar to small units in the soleus. These two are compared in columns Band C in Fig-13. 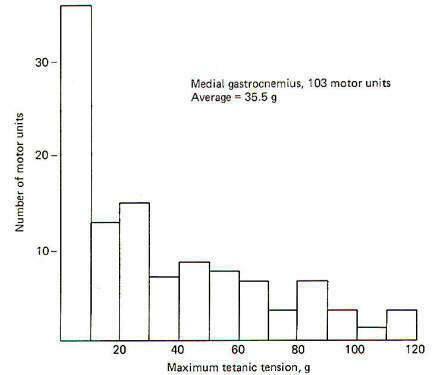 A second examination of Fig-13 will show that the total tetanic tension developed by the large soleus motor unit in column A is nearly 8 times greater than that developed in the smaller unit of column B. Once again, however, because the gastrocnemius is primarily made up of motor units which are larger than those found in the soleus, the maximum tetanic tension developed by its motor units is typically larger. The maximum tetanic tensions developed by the two motor units in column B and C are identical because the size of the motor units is identical. Further examination of Fig-13 will show that the total tension developed during a tetanic contraction is greater than that developed during a single twitch. The reason for this is not known, but may be due to a less-than-maximum amount of Ca 2+ release by the LSR during a single twitch. It may require several consecutive twitches to release enough Ca 2+ to activate all of the cross­bridges and produce maximum tension. The ratio between the twitch tension and the maximum tetanic tension is between 0.2 and 0.25 for both slow- and fast-twitch muscles. An ideal muscle would be able to develop great tension when needed. doing it quickly and smoothly. In addition. it would be able to maintain a high level of activity for prolonged periods of time without fatiguing. Actual muscles exhibit some of these characteristics, but not all of them. Therefore a good compromise all-purpose muscle is one which contains different types of motor units, each capable of producing one or more of the desired characteristics. As previously noted. muscles which of necessity are used intensely for prolonged periods of time are generally composed of small motor units innervating small muscle fibers rich in myoglobin, mitochondrial ATPase. and capillary supply. They contract slowly and produce minimum tension but can operate for extended periods of time without fatiguing because of their ability to produce large amounts of ATP. Recall also that motor units of such muscles are heavily "used" because of their low excitation thresholds, which produce high firing rates in their motor neurons. Such muscles have clearly had to compromise between contractile speed and power and the need to resist fatigue, choosing the latter as the more important feature for their particular role. The soleus is such a muscle. Since not all muscles of the body are exclusively involved in tonic or phasic activity, it is not surprising to find that most muscles are a heterogeneous mixture of all three types of motor units, varying the ratio between the types of units in order to achieve the best possible compromise of contractile characteristics suited for their particular range of activities. A single motor nerve fiber can innervate any number of muscle fibers from one up to several thousand. The innervation ratio represents the number of muscle fibers innervated by a single motor nerve fiber. A small motor unit might have an innervation ratio as low as 10:1. Some of the large motor units of the gastrocnemius have been estimated to be as high as 2000:1. The innervation ratio of its motor units confers certain qualities to a muscle, as we have already seen. An additional quality not previously examined is the smoothness with which fine increases in tension can be added to a contracting muscle. Muscles primarily composed of small motor units are capable of finer, more gradual changes in contractile tension and thus are capable of finer movements than muscles composed primarily of larger motor units. For example, certain muscles of the fingers have innervation ratios as low as 10:1. This means that if a slight increase in tension is called for in order to perform a certain delicate task, the recruitment of one more motor unit will add the tension of only 10 more muscle fibers. This allows for very fine and controlled increments in tension. This is a very important feature in muscles which are often called upon to perform fine delicate and controlled movements. The trade-off which these muscles make in gaining fine control is the lack of contractile speed and power, features which aren't that important in such muscles anyway. Compare this with the gastrocnemius muscle of the calf whose largest motor units have innervation ratios as high as 2000:1. Obviously, firing one more motor unit in this muscle adds the combined tension produced by 2000 additional muscle fibers. This obviously increases the overall tension of the muscle but certainly by a less finely controlled increment than in finger muscles. Of course the ability to add large amounts of tension quickly is obviously more important in the gastrocnemius than are finely graded increments of low tension. As a motor act proceeds from little to maximum strength, motor units with precise characteristics are progressively recruited in a logical order. First are the smallest tonic motor units, followed by larger tonic units, and finally by the largest tonic units. Now if the motor act requires fine control only and not a great deal of tension. the recruitment of motor units might stop here. However, if strength is also required, the higher-threshold phasic units are recruited next. Depending on how much strength is required for the particular motor act, appropriate numbers and types of additional phasic motor units will be recruited. Again, the order will be the smallest phasic units (those with the lowest thresholds) followed by larger and finally the largest phasic units. Recognize that tonic motor units, because of their low tetanization frequencies, can alternate firing to give finely controlled yet long-lasting and smooth contractions at low tension. Thus because of their relatively long twitch durations, some tonic units can begin to relax while others begin to contract while continuing a smoothly maintained level of muscle tension. Phasic units, on the other hand, lack fine control in sustaining smooth contractions because of their short twitch durations, which make tetanus, and hence a smooth alteration of motor unit firings, less likely. The final-strength of any muscle contraction is determined by two factors. The first is the firing rate of the motor units involved, while the second relates to the number and types of units incorporated in the contraction. We have already seen that increasing the firing rate of an individual motor unit will increase the final strength of contraction. Recall that the maximum tetanic tension of a motor unit is considerably greater than the tension produced by a single twitch (Fig-13). It is important to recognize that tetanus in this case is a normal and certainly desirable physiological event adding progressively to the tension developed by the motor unit. We should also recognize that the recruitment of additional motor units adds to the final strength of contraction. Also, because phasic motor units develop higher tension than tonic units, the final strength is partially a function of which type is employed.